The App Builder is a low code, high productivity integrated development environment where you can develop applications on top of your data. Don't have a workspace already? You can get started with a free workspace in moments. The best way to get started with the Oracle APEX App Builder is to build an app. First, let's determine what kind of data you want to build your application on. 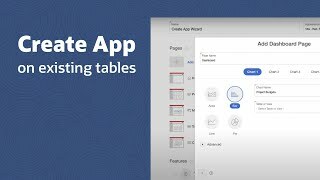 You can easily create apps based existing tables you already have, based on data in a spreadsheet, or based on an entirely new data model. Explore the videos below that walk you through each scenario and teach you how to start using the App Builder. Learn how to build an application based on tables that already exist within your database. 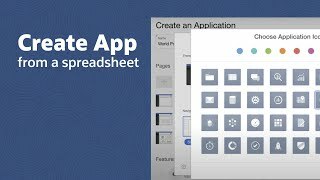 Learn how to build an application based on data from a spreadsheet. 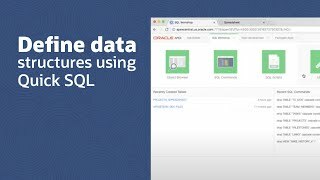 Learn how to use Quick SQL to build a new data model and then build an app on the newly created tables. In Oracle APEX, your application is defined primarily by pages and shared components. Use the Create Page wizards to create new pages, or use Page Designer to modify your existing pages. You can use Property Editor to edit various settings and options, and then run your page to see the result. Page Designer is a powerful IDE that includes a toolbar and multiple panes, used to maintain and enhance pages within Oracle APEX applications. The left pane includes rendering, dynamic actions, page processing, and shared components on the page. You will generally interact with the rendering tree, in the first tab, to quickly select one or more page components to work on in the Property Editor in the right pane. The central pane includes the layout view with associated gallery, where you can drag and drop componnets onto the stylized rendering of the page, component view, messages, page search, and help. The right pane features the Property Editor which is where you maintain all of the attributes for the selected page component(s). You can easily move your application from one environment to another. Once you have completed an app, or you just want to take a back up, click on the export / import button. An app export is a plain-text file with a .SQL extension that can be read by any text editor. As such an export file can readily be uploaded into any source control system as part of your version control. DBAs can check out these application definitions and then import them into test and production environments using tools such as SQL Developer or SQL*Plus. Developers can readily import these .SQL files into any Oracle Database with Oracle APEX (of that version or later) installed. Shared Components are used to define various common controls in a centralized place that can be used multiple times across an application. For example, you can define your application navigation menu, list of values, authentication schemes, and more. This allows you to maximize reuse of your page components resulting in increased consistency and productivity. Use Supporting Objects to define database object installation and upgrade scripts that are invoked when importing an application. You can also define deinstallation scripts to drop objects when deleting an application. Supporting objects allow you to package both the application and database objects needed in a single file. Oracle APEX allows developers to easily switch between design-time and run-time modes when building pages. The Developer Toolbar is displayed near the bottom of your screen when running your app as a developer and allows you to quickly jump back into the App Builder. Theme Roller lets you easily customize the color scheme and other UI settings in real time when running your app. You can open this by clicking on the Theme Roller button in the Developer Toolbar. You can also control various display options for many page components by clicking the Quick Edit button, in the Developer Toolbar, and hovering over the component and clicking on the Live Template Options icon. Keep in touch with what's new with Oracle APEX by visiting us on your favorite social channels! Oracle provides the apex.oracle.com service for demonstration purposes only. Storing of production or sensitive data is prohibited. For production applications you can install Application Express on-premises or sign up for the Oracle Database Cloud Service.